Use this rubric to guide your students in creating a website for a local business! Students can use one of many website creators (I prefer weebly.com) to make a website for a business in their community. An ultimate authentic project, students can present the websites they create to the actual business owners. Those business owners have the option to use the weebly.com domain address or purchase their own domain address specifically for their business. 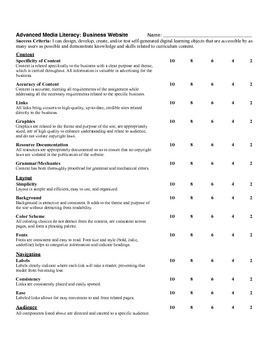 This rubric guides students to think about business, marketing, and web design.